The Sawtooth Oak - Quercus acutissima is most easily recognized by it's fringed acorn cup and narrow leave with bristle tipped teeth, resembling the teeth of a saw. 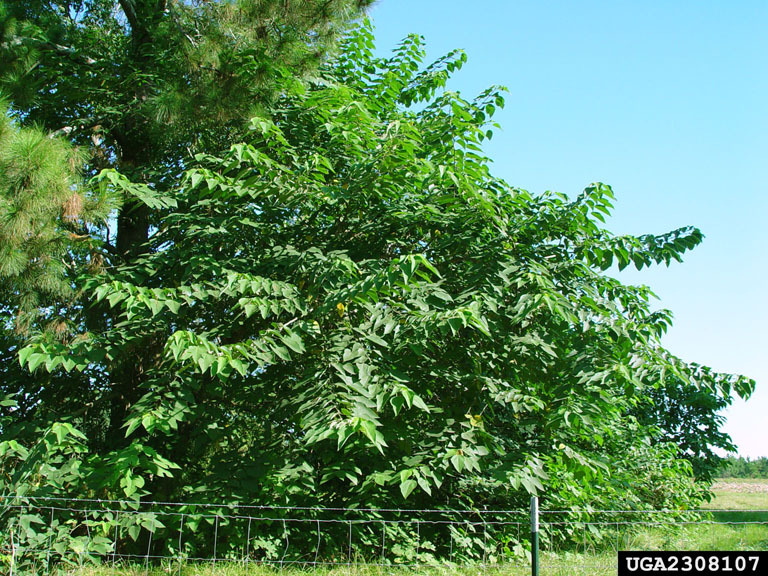 It is a fast growing, deciduous shade tree that can reach heights of 30- 70 feet tall. Sawtooth Oak grows in an erect fashion with a single trunk and dense rounded crown. Originally introduced from Asia, generally found in planned landscapes and is reported to be naturalized in scattered areas from Pennsylvania South to North Carolina and Georgia, South to Louisiana. 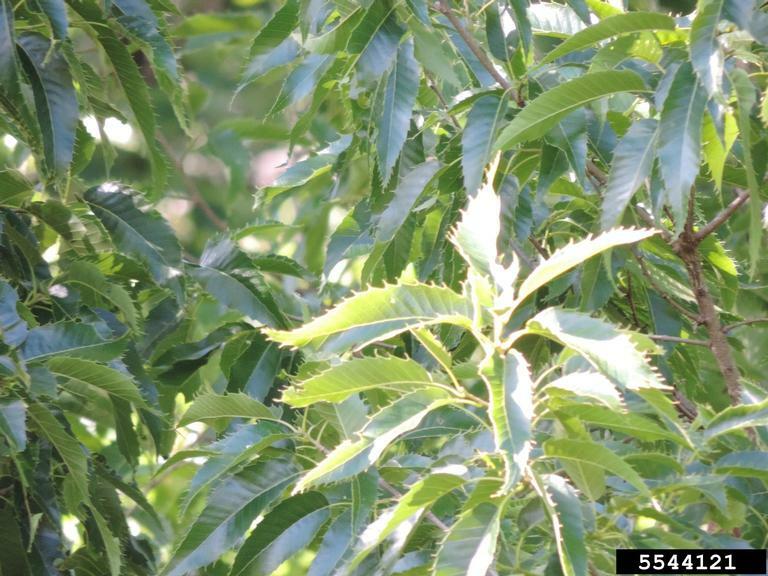 Sawtooth Oak is primarily planted for wildlife cover and food due to it's abundant fruit and fast growth habit. This species is sometimes used for urban and highway beautification as it is tolerant of soil compaction, air pollution, and drought. Named for it's unique leaf edges, the Sawtooth Oak is a beautiful tree. The green leaves are alternate, simple, oblong or obvate, 12-16 pairs of sharp bristle tipped teeth, parallel veins and a lustrous upper surface and dull pale underside. The leaves add to the visual interest by beginning a brilliant yellow to golden yellow color in the Spring, turning dark lustrous green in summer and yellow to golden brown in the fall. The bark is dark gray in color with light gray scales that become deeply furrowed with age. The fruit is in the form of an acorn, the cup encloses 1/3 - 2/3 of the 1-2.5 cm nut. The acorn rim is adorned with long spreading hairlike scales that form a distinctive fringe. 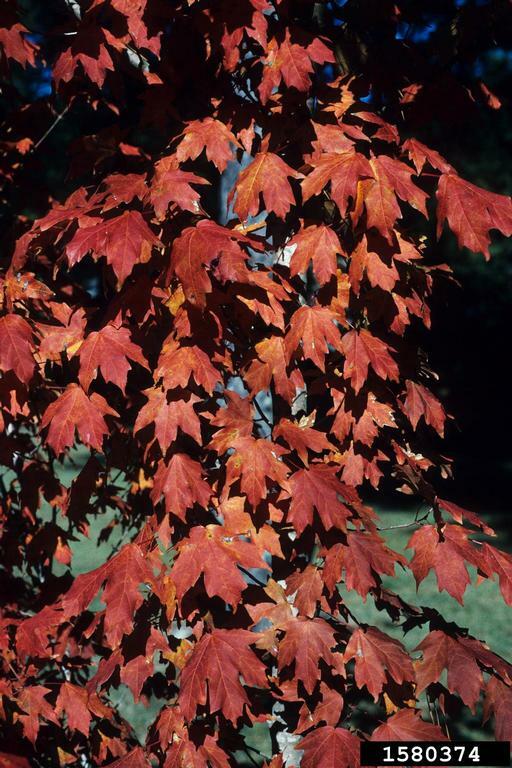 Recommended for hardiness zones 5-9, the Sawtooth Oak can be found at most larger nurseries within those zones. Sawtooth Oak is also considered to be easily transplanted and hardy making it a wise choice for any landscape with room for a large spreading shade tree. 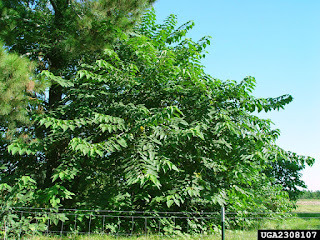 It is similar to the Chinquapin Oak Castanea pumila in appearance, distinguished primarily by the difference in fruit. 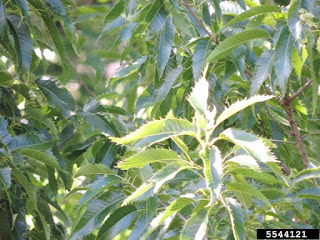 September Elm - Ulmus serotina, is most easily recognized by the combination of alternate simple, double toothed leaves, mature branches with corky wings and Autumn flowering and fruiting. It is a deciduous tree that can reach heights of up to 65 feet tall, it grows in an erect form with a single trunk and spreading crown. It is native to the limestone bluffs, bottomlands and hillsides of Tennessee, Georgia, Alabama, Oklahoma, Texas and Illinois but is rare even within it's native growth range. The September Elm can hybridize with the Cedar Elm though the offspring are difficult to assign to species. The leaves are alternate, simply shaped, with an abruptly pointed short point. The upper leaf surface is a yellow-green color, hairless, with parallel veins and distinctively forked margins. 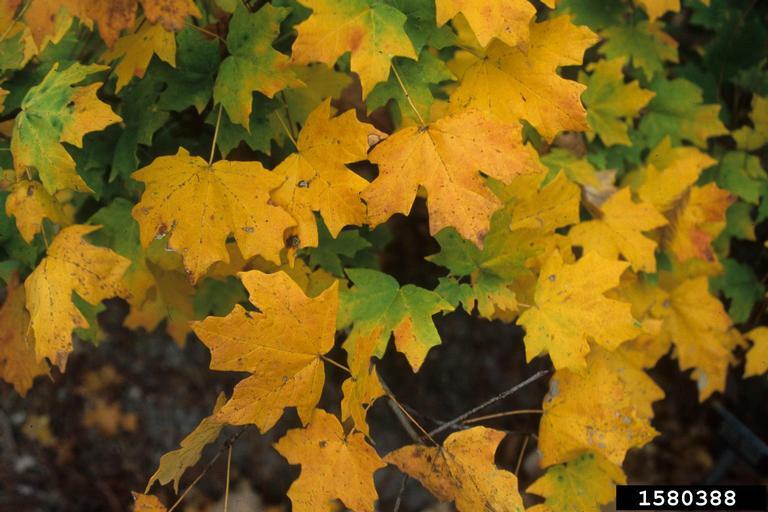 The lower leaf surface is a yellowish gold color with soft hairs. The flowers have 5-6 sepals and occur from Summer to Autumn each year. The fruit is ovoid to elliptic with 1 seed, light brown samara, 1 - 1 1/2 cm long with a notched apex, maturing in Autumn. Winged Sumac - Rhus copallinum is a sumac that is most easily recognized by it's alternate, pinnately compound leaves with 4+ mm winged rachis. It is a small deciduous shrub or small slender tree that reaches heights of only 30-35 feet tall. Generally growing in an erect upright fashion it can have single or multiple trunks and is often thicket forming from the production of numerous root suckers. 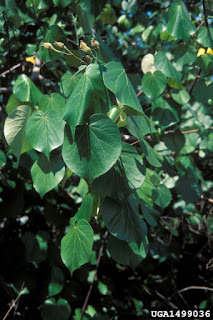 It is native to the North America and can be found growing throughout the Eastern seaboard from Canada and Maine in the North south throughout Florida, west through eastern Nebraska and eastern Texas. It is similar in appearance to the Prairie Sumac with the only difference being the rachis size. The bark of the Winged Sumac is smooth, brown or reddish brown with numerous visible lenticles. The leaves are alternate, pinnately compound with blades ranging in size from 10-30 cm long, having conspicuous winged rachis, the wings each reaching sizes of over 4 mm each, with 9-23 leaflets. 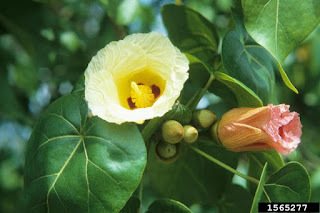 The flowers are unisexual, with male or female typically occurring on separate trees, green-white in color, with 5 petals and sepals each abut 1 mm long. The fruit is a hairy rounded red drupe 4-5 mm in diameters, occurring in late Summer to early Fall and remaining until Winter. 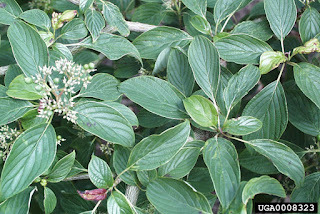 The Alternateleaf Dogwood - Cornus alternifolia, is a small deciduous tree or large shrub that reaches heights of only 15-30 feet tall on average. The Alternateleaf Dogwood has a very distinct layered horizontal branching structure, it is the only Eastern Dogwood with alternate rather then opposite leaves. Native to moist rich woods, slopes, ravines, thickets, stream and river banks, swamp margins, and floodplains from 50-1900 m, throughout the Eastern United States and Canada. It can be found growing from Manitoba east to New Foundland, South to Northwestern Florida, Arkansas and Mississippi. 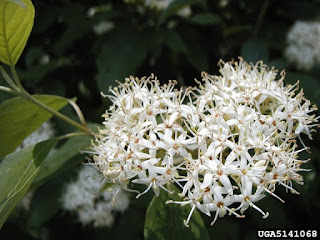 Similar in appearance to the Flowering Dogwood with the exception of the leaves being alternate instead of opposed, and it's flower clusters are subtended by large showy white bracts. The leaf of the Alternateleaf Dogwood is alternate, simple in shape ovate or oval with a rounded or wedged shaped base and abruptly tapered tip. The flowers are individually tiny, creamy white in color and produced in a showy flat topped or convex inflorescence that is 3-6 cm broad, from Spring to early Summer each year. The fruit is rounded and sparsely hairy in the form of a blue drupe that is 4-7 mm in diameter, occurring on red colored stalks every Fall. The Carolina Cherrylaurel or Laurelcherry - Prunus caroliniana, is a small tree or very large shrub that seldom reaches heights of more then 40 feet tall. It is semi-evergreen and can be found growing as a single specimen or in clumps or thickets. The Carolina Cherrylaurel is most often planted in ornamental hedges or as a small specimen/focal tree. It can be found growing throughout most of the South from North Carolina to Texas. 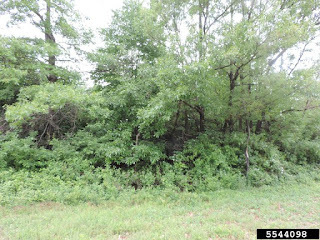 It is most common around the coastal plains, where it forms very dense thickets. 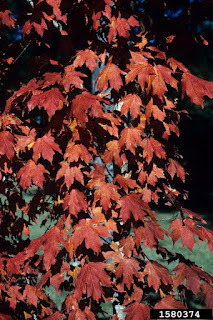 The fastest way to identify this tree when the leaves are present is to crush the leaves which will emit a very distinct cherry fragrance, when no leaves are present the other identifying features include the smooth gray bark with long raised lines or lenticels in a square/mosaic pattern. The leaves are alternate and simple in form 2 - 4 1/2 inches long by 3/4 - 1 1/2 inches wide. 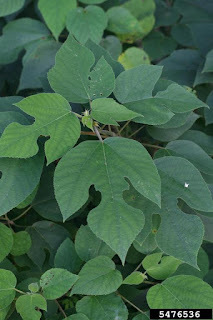 Leaves are generally long oval and tapered with points at each end, blades are dark green and glossy with a pale green underside. The leaf edges are usually smooth but occasionally are toothed. Containing prussic acid the leaves can be fatal to livestock if eaten in large quantities. The fruit is in small clusters of stalked, round fruit that generally remains hanging on the tree all winter. The fruits are eaten by birds and other small mammals. The bark is dark gray in color and if often found decorated with lines of holes from Yellow Bellied Sap Suckers (Sphyrapicus varius). The flowers are small only 5mm in diameter with 5 petals, creamy white in color, occuring in early - mid Spring. Mountain Basswood - Tilia heterophylla, is a large tree that has the ability to reach heights of upwards of 100 feet. It is easily identified as a Basswood by the soft, light gray-brown bark that is moderately thin with long, shallow, parallel, V shaped fissures and flat topped ridges. The bark of the Mountain Basswood appears to be compressed against the tree and is molded to the ridges and fissures in a pattern that does not have rough edges. Young bark, located high in the tree smooth and light gray in color. The leaves are rounded to an abrupt tip with a coarse sharp toothed margin. The lower leaf surfaces are white and woolly. Occasionally in late Winter clusters of pea sized berries can be found dangling in a shape similar to spread fingers from the center of small, elbow shaped wings that are attached to twigs. 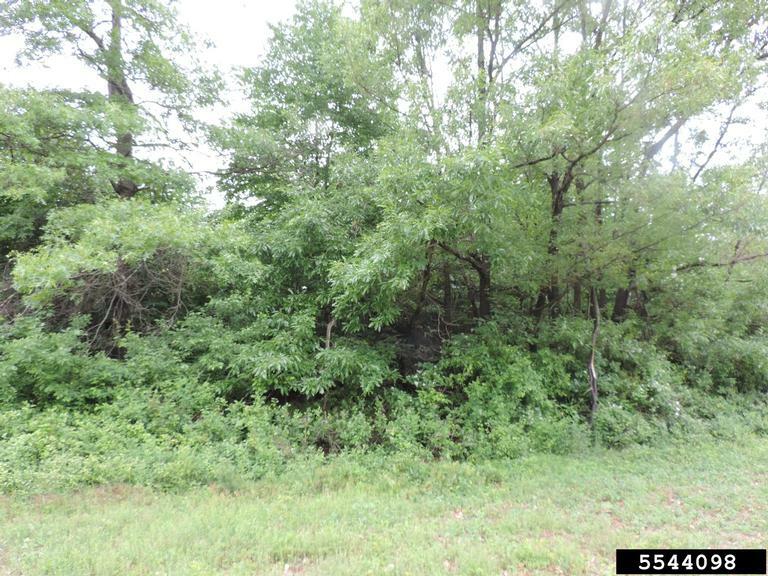 Mountain Basswood is a native species but is not commonly found even within it's natural growth zone. It is a rare tree but can be found throughout the entire United States. 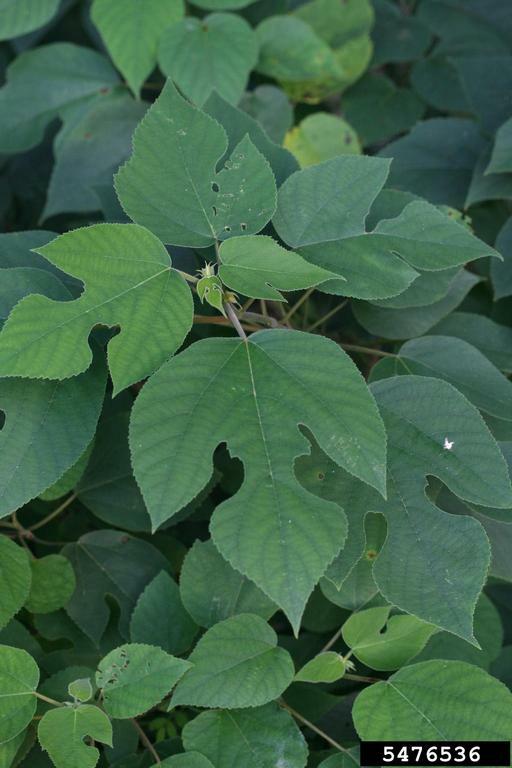 The Mountain Basswood can be distinguished from the American Basswood by looking at the leaves. 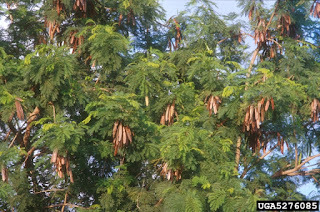 The White Leadtree - Leucaena leucocephala is most easily recognized by the combination of bipinnate leaves, compact heads of creamy white flowers and flattened red-brown legumes. It is a deciduous or evergreen shrub or small tree that reaches heights of only about 15 feet tall. The White Leadtree grows in an erect or upright fashion with a single trunk and spreading crown habit. Originally introduced from the West Indies it has been cultivated and escaped cultivation in Southern Florida and South/Eastern Texas. In all areas of the United States the White Leadtree is found growing it is considered to be invasive and poses a threat to native weaker plants. 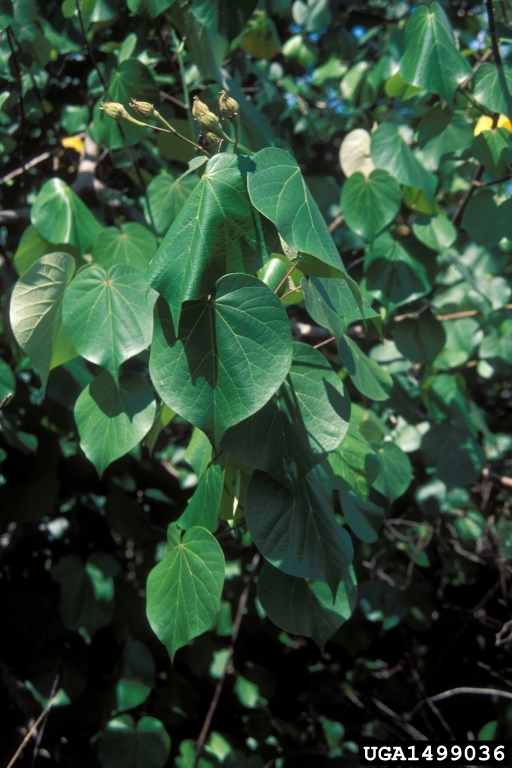 The White Leadtree has alternate bi-pinnate leaves with blades that are 8-10 cm long and up to 13 cm broad with 4-9 pairs of primary segments. Leaflets 10-20 opposite pairs per segment 8-14 mm long, oblong, with pointed tips and a gray-green upper surface. 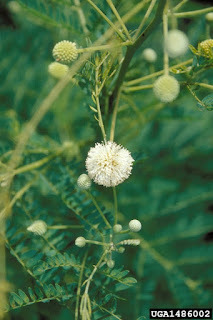 The flowers are bi-sexual, produced in rounded creamy-white heads that are 1-2 cm in diameter on stalks that are 2-3 cm long and 2-4 cm broad. 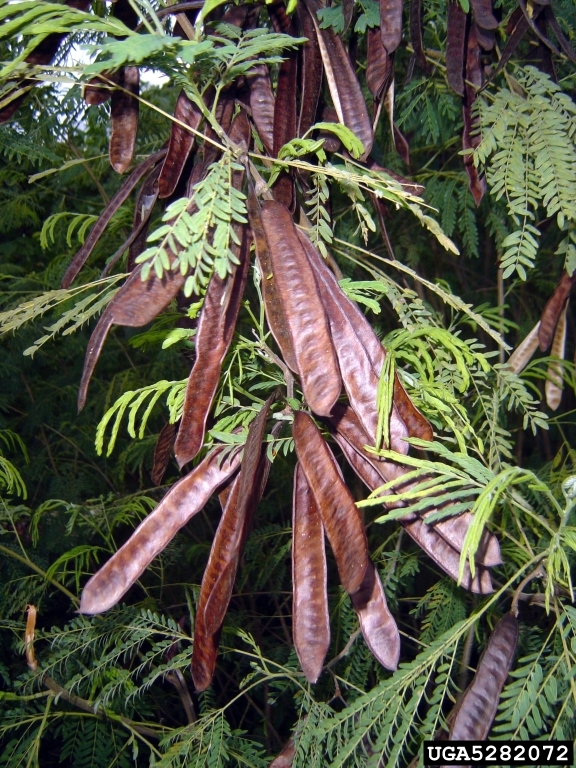 The fruit is a flattened reddish-brown legume ranging in size from 8-15 cm long and 2-4 cm broad born in crowded dangling cluster and occurring year round. 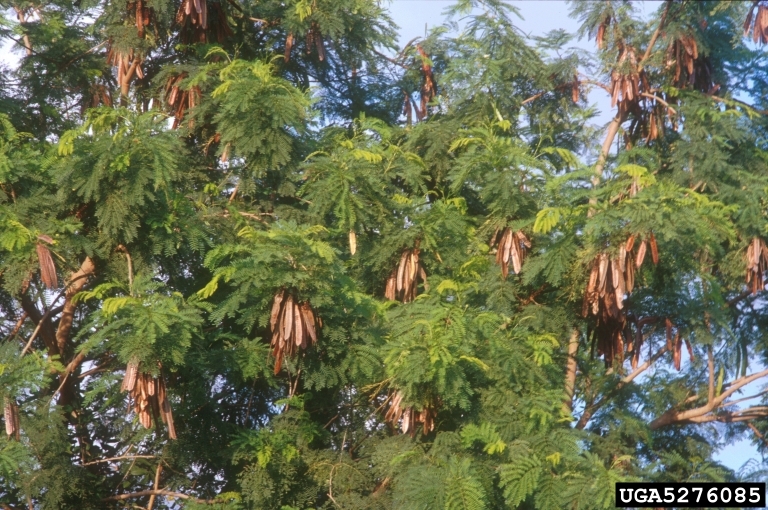 Leucaena is a small genus of only 22 species that are distributed mostly in the American tropics only 2 are native to North America none in the East. The White Leadtree is similar in appearance to the Wild Tamarinds - Lysiloma, which also have white flowers only theirs are not born in compact heads. Pitch Apple - Clusia rosea (also called Scottish asphodel), is most easily recognized in Southern Florida by it's large opposite, stiff and obovate leaves. An evergreen large shrub or small tree that can reach heights of up to 55 feet tall, but usually much shorter on average. The Pitch Apple is considered to be native to South Florida by many, and non-native by others, it is found on disturbed sites and in hammocks it is widely cultivated but uncommon in natural undisturbed locations. Pitch Apple is similar in appearance to the Seven Year Apple which also has opposite, simply shaped leaves but dark green lustrous upper surface instead of dull surface. The Pitch Apple grows in an erect form with a single trunk and dense crown. The leaves are opposite, obvate or paddle shaped, simple, thick and very stiff. 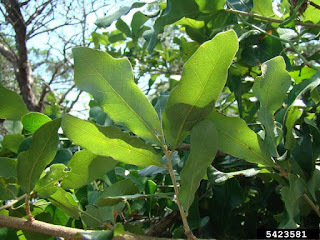 The upper leaf surface is a dull grayish green with a lower surface that is yellow green. The flowers are bisexual and born in short-stalked clusters of 1-3 with 6-12 lustrous white petals that are tinged with pink. The fruit is rounded and 5-6 cm in diameter, becoming brown at maturity and splitting in sections to expose large red seeds. The Fraser Magnolia - Magnolia fraseri is most easily identified by the combination of gray colored trunk, leaves that are eared near the base and hairless buds and twigs. It is also referred to in some areas as the Mountain Magnolia. Native to rich woods and cove forests from 300-1520 m, this species is confined mostly to the Southern Appalachians, found in Virginia, West Virginia, Kentucky, Tennessee and Northern Georgia. It is similar in appearance to the Pyramid Magnolia and is often only distinguished by the native range and habitat. The Fraser Magnolia is a deciduous tree that reaches heights of about 80 feet tall. It grows in an upright and erect form with either a single or multiple trunks, the crown is spreading, irregular and most often high branching. The bark is gray to gray-brown in color and smooth or just slightly roughened, sometimes it is compared to concrete in appearance. The leaves are produced in whorl like clusters near each branch tip, they are simply shaped, ovate or nearly spatulate (spoon shaped). The leaves are broadest near the tip becoming more narrow closer to the base which is eared. The upper leaf surface is green and hairless, while the lower is paler in color. The entire leaf becomes a coppery brown at maturity. The flower is creamy white in color, 16-22 cm in diameter, fragrant and showy usually with 9 tepals each occurring in late Spring annually. The fruit is in a cone like form, shaped like a small cucumber, ranging in size from 6-13 cm long. Fruit is green when young, changing to pink when mature. Once mature each fruit splits to reveal bright red seeds that are 7-10 mm long. Fruit matures in late Summer or early Fall each year.